As I was walking around my yard today, looking for some sign of Spring, I wasn’t expecting much. The yard looks very brown and dead. I had to look very, very carefully for signs of life. I found the promise of Spring, secretly biding its time in my yard. 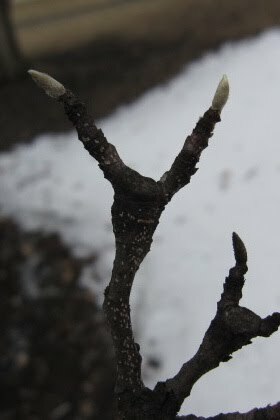 These magnolia buds are so very tiny, and there is still snow on the ground beneath them. 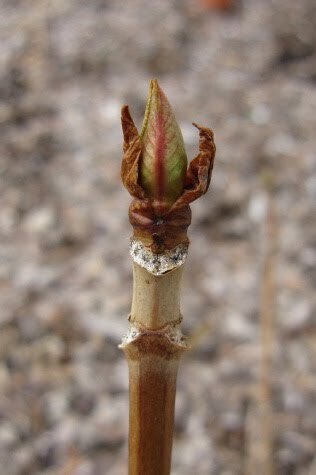 But soon, they will grow larger and larger, until finally the blooms plop out of their buds. 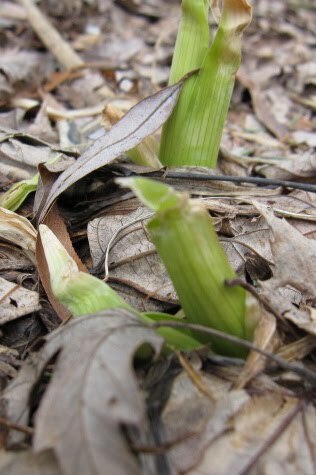 Among the dead leaves, I found green sprouts. These little, tiny sprouts will lengthen and grow up, taller and taller, until summer comes and their orange brightness fills the yard. Oh, I excited for Spring to arrive! How about you? Tomorrow I will be writing some memories of Spring, and I invite you to join me! Write a post about Spring, then come back to Lemon Drop Pie tomorrow and add your post to my linky list! Your lovely pics are making me long for warm weather . . .
Oh you captured it!!! Yea for spring..well we celebrated by going out and flying a kite! Spring never gets old! I can't wait for spring! I need sunshine!